You are currently browsing the tag archive for the ‘harbour’ tag. 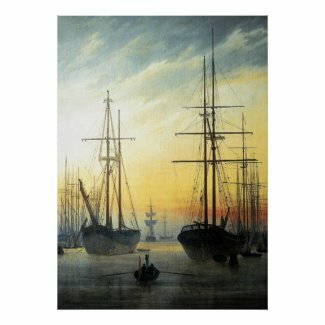 View of a Harbour – Caspar David Friedrich Card | Zazzle #Sold! View of a Harbour – Caspar David Friedrich Card created by FirstNightVintage. ONE FROM THE ARCHIVE FOR REMEMBRANCE DAY. Prints & Greeting Cards available – click through to original post for the link to buy. First Night Design | Land, Ho! A direct contrast to the feel of yesterday’s Song for Freedom, Land, Ho! 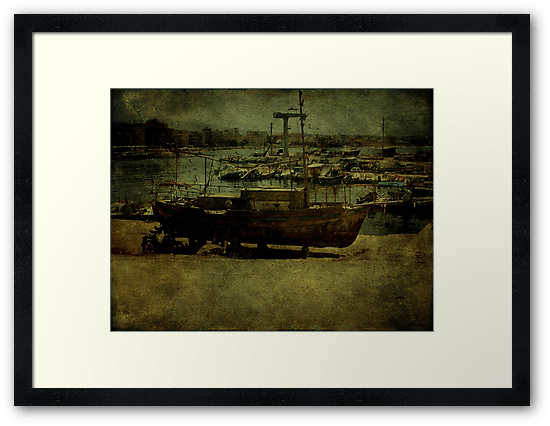 is another design from a few years ago that centres on my photograph of an abandoned fishing boat in Nea Chora in Chania on the island of Crete, and to which I added textures from Shadowhouse Creations. To say ‘abandoned’ is, perhaps, to stretch the truth since one sees many apparently abandoned boats (and houses) on this island that have not been abandoned but have been worked on for years without any sign of improvement! When it comes to the dilapidated houses, it can be assumed that the owners are a disparate collection of family members who have inherited the property and who can’t agree on what should be done with it. It is so sad to see them going by the board as they are often three or four hundred years-old and beautiful examples of Venetian or Ottoman Empire architecture. When we were staying with friends in Crete a few years ago, we went to the Remembrance Service at the Allied Cemetery, designed by Louis de Soisson, in Souda Bay. It is a beautiful setting on a hill from which you can see the whole of the bay. Every year, an old ex-pat recites the They Shall Grow Not Old stanza, as he did when we were there. He infuriated us by saying ‘We shall remember them’ instead of ‘We will remember them’. When we mentioned how frustrating this was, we were told that he gets it wrong every year, even though he has been told many times about the error. He refuses to let anyone else do it, apparently. It’s a great shame. My actual words at the time — under my breath — are unprintable. It would be lovely to say that the photograph I used for At the Going Down of the Sun was of Souda Bay but although it is in Crete, I can’t remember where! I added a delicious texture from 2 Lil’ Owls to create a Turner-like effect. This is a quick post, partly because my touchpad is being recalcitrant, to showcase View of a Harbour by Caspar David Friedrich which is new in my vintage store. The perfect binder to keep all your travel plans in one place! This is a digital painting of the mosque in the Venetian Harbour in Chania, Crete. It is one of the oldest surviving buildings from the time of the Ottoman Empire and was built in 1645. Worship took place in the mosque until 1923 when the Muslims left the island in an exchange between Greece and Turkey. Janissaries is the Turkish word for ‘new troops’, men who were recruited, ironically, from the non-Muslim fraternity and worked as household troops and bodyguards of the sultan. Once containing the Chania museum, in recent years the mosque has been hosting small art exhibitions.